This was a project for landfillart.org. 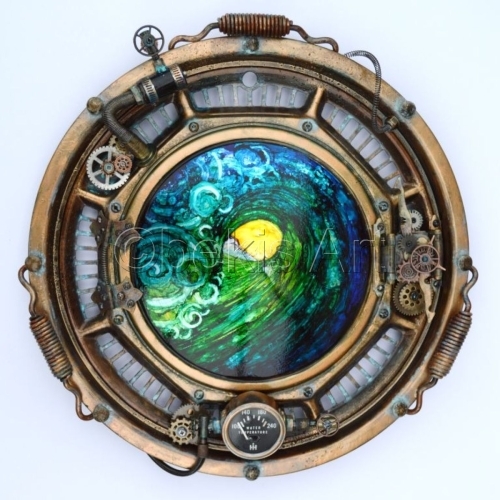 This piece depicts a steam punk porthole using various materials: springs, gauge, hinges, old bike parts and gears, many of which are recycled parts. 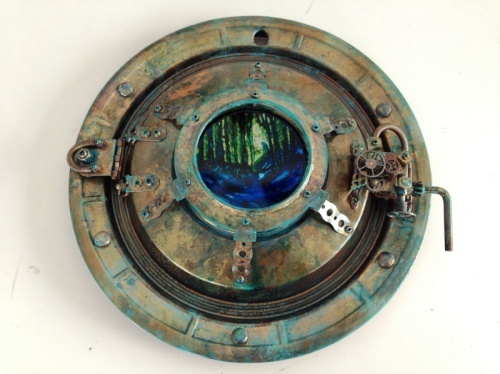 Looking through the porthole is a surfer riding a wave done in alcohol inks. But to me it is my portal to the sea. 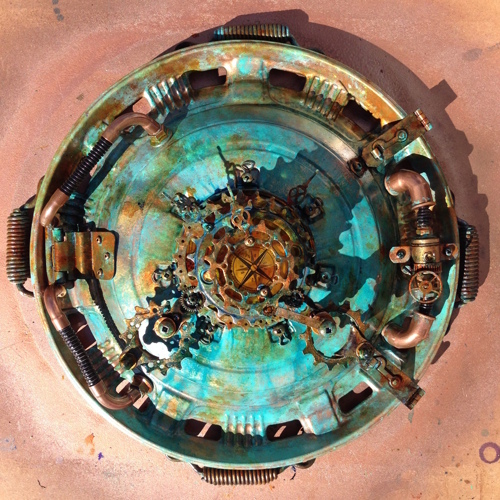 A steam punk inspired sculpture using an old hubcap, hinges, gears, springs, bike parts and various bits of metal hardware to create a 'porthole.' 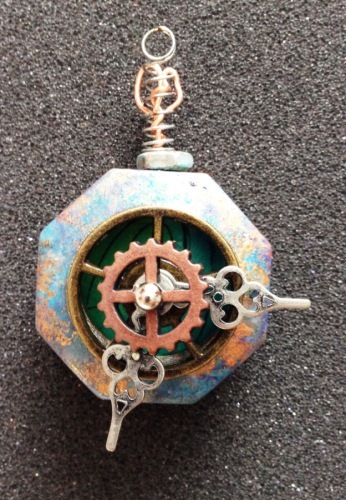 But to me, it is a 'portal' to what lies beneath the oceans surface. 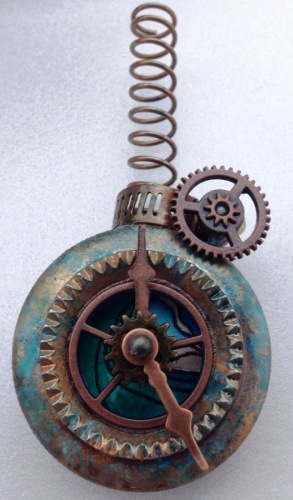 Steam punk inspired ornament using old bike parts, clamp, spring, gears and clock hands with an image of a water colour surfing wave inside. 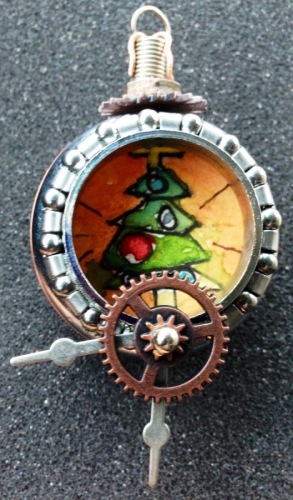 Steam punk inspired metal ornament made from bike bearings, gears, copper wire and clock hands with watercolour Christmas tree (one of my boys' image) inside. 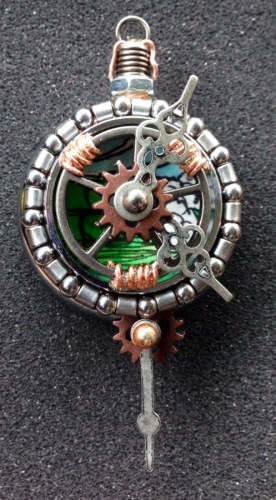 Steam punk inspired metal ornament made from bike bearings, gears, spring, and clock hands with water colour image of surfing waves inside.